How has one of the NBA’s best defensive teams turned into a sieve? The Jazz are trying to figure it out, too. Leah Hogsten | The Salt Lake Tribune The Utah Jazz lost to the Toronto Raptors, 111-124, Monday, Nov. 5, 2018 at Vivant Smart Home Arena. Everyone knows the hallmark of the Utah Jazz is stingy defense, right? They can’t light it up like the Golden State Warriors, but they always, always make it tough for opposing teams to get baskets. Except this year, they’re not. Through 10 games, they’re 13th in opponents’ points per game (110.2), 16th in the league in defensive rating (109.3), and an eye-popping 27th in opponents’ field-goal percentage (48.3). After Monday’s 124-111 loss to Toronto — the team’s fourth straight defeat — some players expressed their dismay that they haven’t been able to fix the defensive woes yet. Beyond the broad strokes, though, what specifically is it that needs to be fixed? Well, for starters, per the analytics site Cleaning the Glass, the Jazz are having particular problems in allowing shots at the rim and in the midrange. While Utah is doing a good job of limiting opponents’ opportunities at the rim — they rank seventh in the league, with just 33.7 percent of shots coming there — they haven’t been particularly good at stopping those shots. Teams are converting 65 percent of them, which ranks the Jazz 23rd. It’s been even worse in the midrange. There, opponents are not only taking a high volume of shots (36.3 percent), they’re making 44.6 percent of them — which ranks the Jazz worst in the league. At least on 3-pointers, the Jazz are faring a bit better. They rank eighth league-wide in limiting opponents to taking just 30 percent of their shots from deep. However, the narrative has been that Utah is allowing open looks, and the evidence bears that out, as the team drops to 19th in the league in seeing 36.7 percent of those 3-pointers go in. That same story plays out as well on transition attempts. While the Jazz allow the fifth-fewest transition attempts in the league (14 percent), when opponents do get out on the break vs. Utah, they’re converting their chances. The Jazz ranks 20th and 22nd, respectively, in points per 100 possessions allowed via transition play, and points scored per 100 transition plays. Coach Quin Snyder said that particular problem was especially apparent against Toronto. Furthermore, the players acknowledge that they haven’t been as assignment-sound as they ought to be. Against the Raptors, they made the mistake of going under screens against good shooters like Kyle Lowry and Fred VanVleet, allowing open 3s, and going over them against the poor-shooting-but-slashing Delon Wright. To a man, the Jazz acknowledge that even when they’re getting the details right, they’re not doing so consistently. That, as much as anything, needs to change. 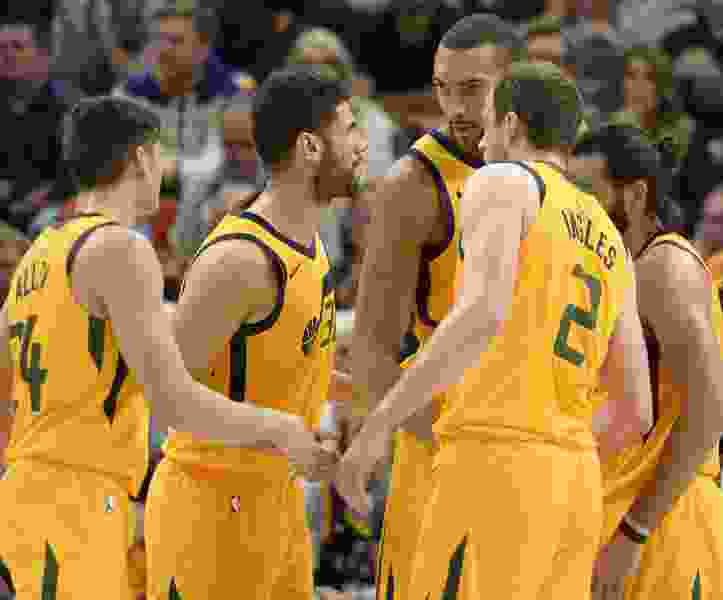 “We’ve shown patches where we can be really good and be the team we know we can be, but we’ve shown a lot more of the other side of it to this point,” Ingles acknowledged. Snyder agrees with that much. It’s not that his players haven’t been trying — it’s that they haven’t been doing the right things often enough. Tipoff • Wednesday, 7 p.m.
About the Jazz • Donovan Mitchell, who missed Monday’s loss to Toronto with a sprained ankle, participated in Tuesday’s practice, has been upgraded to “probable” vs. the Mavs. … The Jazz are 0-4 at home for the first time since their inaugural season as the New Orleans Jazz. … Rudy Gobert led the way in the win in Dallas, with 23 points, 16 rebounds, and three blocks. About the Mavericks • Dallas had lost six straight games before Tuesday night’s 119-100 win against the Wizards. … The Mavericks are 0-5 on the road so far this season. … Dennis Smith Jr. scored 27 points on 12-for-19 shooting in the teams’ previous meeting.